Your elderly cat may be less spry than when he was young, but he shouldn't have balance problems if he's healthy. As a cantankerous kitten, your cat zipped and zapped. As an adorable adult, he pranced and pounced. Now a stodgy senior, he walks and wanders. Most aging cats slow down, but you need to watch for balance problems. Stumbling and staggering are unusual and often indicate health problems. Despite their archetypical grace, cats lose their balance for countless reasons. The occasional gaffe is nothing to worry about, but chronic clumsiness may mean your cat's sick. Neurological disorders, tumors and infections can all make your cat fall down, slip or run into things. So can the medications used to treat them, as well as old age itself. Elderly cats are more susceptible to many diseases and loss of balance is often one of their initial symptoms. Watch for accompanying issues and visit a veterinarian as soon as possible. Information about possible medical conditions can help prepare you for what's coming, but it's not a substitute for speedy professional treatment. If your feline friend begins losing his balance and there's no obvious cause, he might have one of many neurological diseases. Just like you, your cat's got a brain and spinal chord that communicates with the rest of his body through his nervous system. When something goes haywire in a specific spot within the brain, your cat may have issues standing or moving and even lose muscle control. One condition, called encephalitis, can affect the entire nervous system. Many conditions are degenerative, so don't try to wait out mild symptoms. The quicker you get your cat to a vet, the quicker you can get a proper diagnosis and begin treatment. Older cats sometimes develop brain tumors that, because of their location, prove inoperable. After your cat starts falling down, you'll undoubtedly start paying more attention to him. Look for other symptoms. If he's scratching at his ears and shaking his head, he may have an ear infection. If you spot black debris in your cat's ears, he probably has ear mites. You might think this means your cat's ears have something to do with his balance, but that's not the case. As in all mammals, balance is controlled by part of the brain. 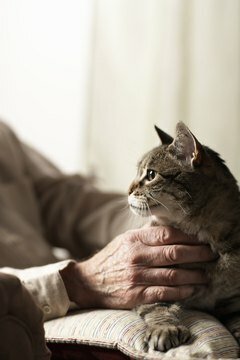 Elderly cats sometimes get inflammation or infection there -- it's call vestibular syndrome -- which usually causes sudden, acute balance issues. If your cat also seems like he has a cold, he may have feline infectious peritonitis. This can be serious, especially if he starts having trouble breathing as fluid builds up. Sometimes elderly cats fall down for the same reasons older people do. Your furry companion can get the feline equivalent of arthritis, senility and Alzheimer's disease, for instance. Another condition that causes balance issues is cognitive dysfunction syndrome. It's essentially a catch-all condition that means there's no apparent reason why a cat is having neurological problems. Thanks to modern veterinary medicine, cats commonly live into their late teens, but they can't live forever. As your cat ages, he's eventually going to get sick, but that's no reason to be sad. If you monitor his health closely and spot early balance issues, you can make sure he gets proper end-of-life care and lives in relative comfort and happiness with you and your family.